John Lennon’s Hofner Senator sells for Â£205,250! 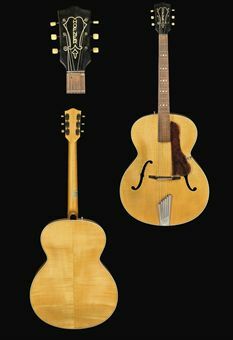 A 1958 Hofner Senator guitar owned by John Lennon sold for Â£205,250 at Christies London auction yesterday. Guitars owned by John Lennon very rarely appear on the market and George Harrison’s verification of this guitars’ provenance in his letter to Lily Evans is invaluable. Harrison’s own keen interest in guitars meant that he had a clear recollection of the models he and his fellow Beatles owned and used over the years. In the course of Christie’s research, Lennon’s friend and colleague Pete Shotton told us that although he himself didn’t remember who played what guitar [Shotton himself was not a guitarist but played the washboard in the Quarry Men] George had an extremely good memory for detail and would not put his name to a statement unless it was correct. There has been some written speculation in the past that this Hofner Senator may be the very one that former Quarry Man Ken Brown owned, however this seems unfeasible when the provenance of this guitar is analysed. In the course of their research Christies spoke to Ken Brown himself about this rumour and he stated that he did not believe this to be the same guitar as the Hofner Sentator he owned. Also when it is considered that fellow Beatle George Harrison recalls Lennon owning one of these models, and that this guitar’s history shows that John gave his Hofner Senator and a white Vox guitar to trusted friend and road manager Mal Evans. Evans did not appear on the Beatle scene until 1963 long after Ken Brown’s six-week interlude with the Quarry Men in 1959, and as far as we know their paths never crossed. All these factors appear to refute the Ken Brown association with this particular guitar entirely. In the late ’50s and early ’60s American electric guitars were not readily available in the UK and if they could be found were very expensive, as a result budding guitarists had to rely on German-made and European electric guitars. Although Lennon came to be identified with the Rickenbacker 325 from late 1960-1961 onwards, what he himself described as his firstÂ ‘real guitar’ was a Hofner. As soon as John Lennon and George Harrison began to earn some money by playing at the Casbah club in Liverpool with the Quarry Men, they both purchased Hofner Club 40 electric guitars, John’s first Hofner, and George’s second, his first being a Hofner President. John’s guitar was acquired via hire-purchase from Hessy’s Music Shop on August 28th, 1959 and he recalled in an interview that when ..George and I saw a Hofner Club 40 we thought it was the end. All the Quarry Men’s performances in 1959 at the Casbah Coffee club were without a drummer – if they were asked about this absence, they would respond:Â “The rhythm’s in the guitars”. The line-up of guitars at this time was John and George with their two Hofner Club 40s; Ken Brown with his Hofner Senator [for the 6 weeks he was with the Quarry Men] and Paul McCartney with his Zenith. Hofners are closely associated with all the early Beatles, although in November 1959 George Harrison had moved on from his Hofner Club 40 to a Futurama, the closest thing he could get to a Fender Stratocaster. In January 1960 when Stuart Sutcliffe joined the group as bass player he purchased a large electric Hofner 333 bass guitar with money he had received from selling one of his canvases at the Walker Art Gallery in Liverpool. With the addition of Sutcliffe the group’s name changed from the Quarry Men to The Beatles [as a tribute to Buddy Holly’s Crickets although initially spelt Beatals]. Photographs of the group during their landmark first tour of Hamburg show Lennon playing his Hofner Club 40. It was this gruelling tour which provided the group with the foundation for their success, as Mark Lewisohn wrote:Â Five hundred hours on stage in Hamburg…forged the style that would conquer the world. It seems highly probable that Lennon may have purchased this Hofner Senator whilst earning money in Germany either in 1960 or the following year. It was there in Hamburg in 1961 that Paul McCartney acquired what was to become his signature instrument, his first Hofner 500/1 violin bass. The lack of photographic evidence of Lennon with this Hofner Senator suggests that he probably kept this guitar at home for writing purposes. It is significant that John Lennon had this guitar during those formative years in the early sixties, and that it was with him right at the beginning of his phenomenal career, when he was writing such early classics as:Â Please Please Me – The Beatles first No 1;Â Do You Want to Know A Secret, There’s A Place, I Feel Fine, Help!andÂ Ticket To Ride to name but a few. Putting speculation aside for a moment, it is certainly true that John Lennon guitars with provenance are exceptionally rare and to see one from Lennon’s early career supported by documentation from fellow Beatle George Harrison is scarce indeed. Serial No.4697, Senator model, natural finish, 22 fret fingerboard with five triple dot inlays, back of the neck applied with a square paper sticker the blue background with cream lettering spellingÂ LOVE; Compensator tailpiece, bound f-holes, plastic facia with a Hofner logo, simulated tortoiseshell pickguard; and contour case containing a few pieces including a contemporary set ofÂ Martin Bronze strings, and a simulated tortoiseshell guitar pick; accompanied by: a facsimile copy of a typescript letter from George Harrison to Mal Evans’ widow Lily on October 26th, 1982 onÂ Harrisongs Ltd. headed stationery, regarding this guitar which states that this:Â Hofner is one of the first guitars of John’s going back to the early days in Liverpool (1960-ish)… ; and a photograph of Lennon playing a Hofner Club 40 at the Top Ten Club, Hamburg, 1960 —8x10in.(20x26c.) (printed later). Two Hofner Violin basses, both signed by Paul McCartney,Â were also sold in the same auction; a 1960’s one sold for Â£8750 and a 1970’s model for Â£10, 625.